Hi everyone! I have another recipe to share with you today, starring another cool flour: coconut flour! One reason I love baking with coconut flour is that it is packed full of fiber: a single serving of 2 tablespoons delivers a whopping 5 grams of fiber! It is also gluten-free, low in carbs, and high in protein. Coconut flour is made by grinding dried, defatted coconut meat. I hope you enjoy these as much as Allyn and I did! 1. Preheat oven to 350 degrees F. Line a muffin baking pan with paper liners and set aside. 2. In a small bowl, mix the water and ground flax and set aside. 3. In a medium bowl, stir the coconut flour, coconut sugar, baking soda, and cinnamon. 4. In a large bowl, mix the bananas, eggs, vanilla extract, coconut butter and peanut butter. Using a wire whisk or electric mixer works very well! Next, slowly add in the flaxseed-water mixture, yogurt and milk. 5. Add the dry ingredients to the wet ingredients and gently combine. 6. 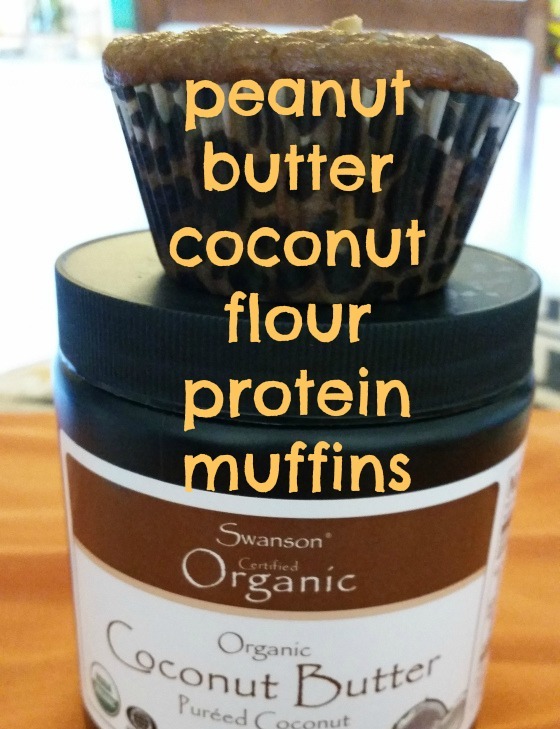 Scoop batter into your muffin pan, filling each muffin cup 3/4 cup of the way. 7. Bake for 20-25 minutes. Remove from the baking pan and cool muffins on a wire rack. 8. Store in an air-tight container. These muffins also freeze well!